Warner Center Shuttle service will be extended south to Ventura Boulevard seven nights a week from 9:30 p.m. to 4 a.m. starting Sunday, July 22. Here is the new timetable. 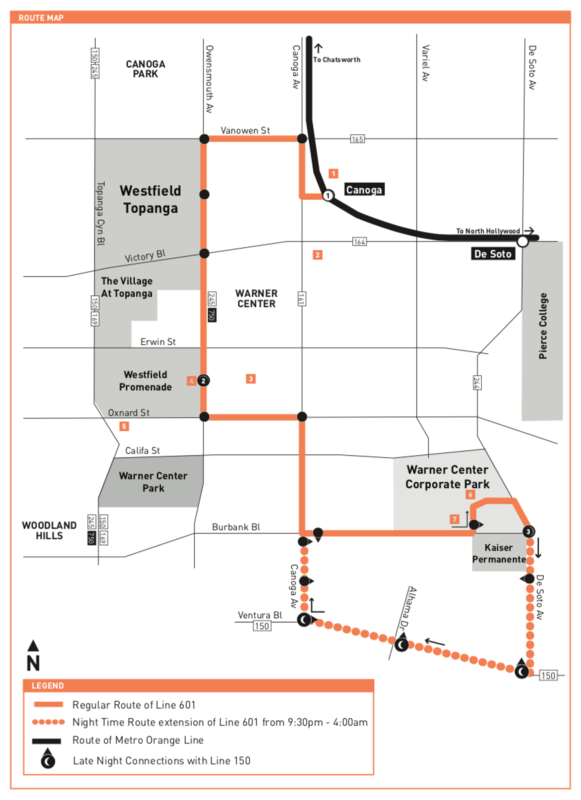 After serving the stop on De Soto Avenue and Burbank Blvd., the Warner Center Shuttle will continue south on De Soto, turn right on Ventura, right on Canoga Avenue and resume its regular route. This change will allow connections to late night service provided by Line 150. A map of the nightly route and stops is shown below. For more information on the Warner Center Shuttle, visit metro.net/warnercenter. Are we still using the term “Night Owl”? Is there a new schedule with revised times? Good question. I’ll see what I can get. Addendum: the new timetable is in the works. I’ll post the link as soon as it’s ready to leave the barn, so to speak.